Let me begin by stating that I am not going to pretend to be a huge Saw fan because I’m not. I only saw the first two films and that’s pretty much the extent of my Saw knowledge. The film’s franchise is close to releasing yet another sequel and as die hard Saw fans are anticipating its’ arrival, Konami has released its’ newest survival horror/puzzle game which is based on the Saw franchise. The idea of Saw being translated into a video game may seem laughable to some people, however, this reviewer was surprisingly impressed with this title. Let’s being with the basic plot of the game; from what I can gather the game takes place between Saw 1 and 2. 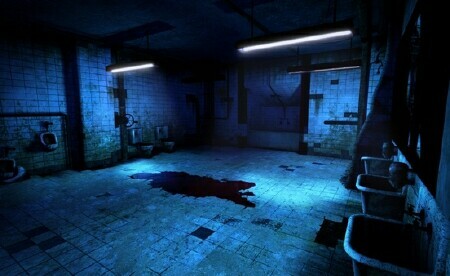 The player steps into the role of Detective David Tapp, Danny Glover’s character from the first Saw film however, Danny Glover’s likeness and voice doesn’t make an appearance in the game, but to many Saw fans’ pleasure Tobin Bell is in the game to voice the maniacal Jigsaw and the moment you hear him say for the first time, “I want to play a game” you’ll be ready for the rest of this game. Basically, Tapp has become extremely obsessed with the Jigsaw killer, so much so that he has made the lives of all those who came in contact with Jigsaw miserable. Jigsaw kidnaps Tapp and traps him in Jigsaw’s “playhouse” along with every person who Tapp has come in contact with. Familiar characters like Amanda are back and put through Jigsaw’s game once again. That is the basic plotline, work your way through the asylum, free the other victims Jigsaw has trapped, while avoiding dangerous traps and being put through multiple tests in order to find Jigsaw, where you will be forced to choose; Move on with your life? Or try and catch the Jigsaw killer once and for all? A fairly loose plot in my opinion but I find it interesting how they managed to fit the game so well into the Saw mythos while making nods at all the films. However, the relatively weak plot is boosted a bit by the entertaining and sometimes mentally trying gameplay. Konami has made a statement where they want to make a string of Saw games and turn them into the next Silent Hill franchise so I felt it was right to classify this game as a survival horror game with puzzle elements, puzzle being the dominant part of the game. Obviously with Saw you can expect alot of puzzle solving and believe me when I say that they are no picnic. The player may find themselves literally on the edge of their seat trying to release a man from a table with an axe swinging above his head, getting closer and closer to his body before the clock hits zero. Or trying to find a combination to a door with multiple bombs placed around you. The main puzzles are when you must free the six main people Jigsaw has captured, Konami made sure they were mentally challenging and physically suspenseful enough to keep the player wanting more. There are side puzzles such as reaching into a toilet filled with used syringes, a barrel of acid to find a key, rearranging wires in a panel to unlock doors, rearranging pipes to drain poisonous gas pouring into the room and so on. The first time dealing with these challenges they will be very challenging and even entertaining, however aside from the main traps the rest of the puzzles tend to get rather repetitive and borderline boring at times. 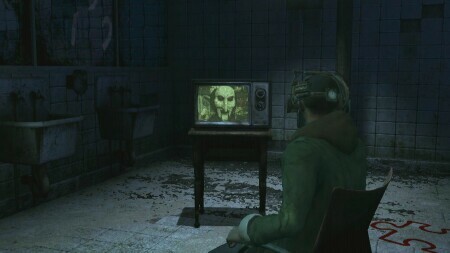 Puzzles aren’t the only aspect of game play, the player must manage items you collect so that when the opportunity rises they can build an explosive charge or a stun bomb to combat other victims Jigsaw has trapped, who are looking to kill you because of something Jigsaw has planted on your person. Combat is also fun because there are variations of weapons the player can use from nail bats to scissors, the possibilities are endless. They can employ stomp moves and counter attacks as well to fight enemies however, the fights are few and far between. 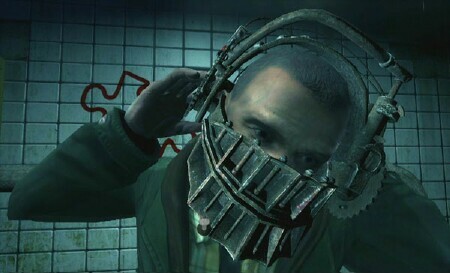 I did enjoy how the game forces the player to use their senses of sight and sound, they could save your life in this game because Jigsaw is crafty and he has periodically placed tripwires around doors and in hallways attached to a shotgun and if triggered it’s off with your head. All in all the game play can get very repetitive but most of the puzzles make the game very entertaining. In conclusion, the relatively simple and bland story mixed with repetitive game play and puzzles brings the overall enjoyment of the game down a bit however, more often than not, the game is very suspenseful and filled with some great “scare moments” that make the game very worthwhile to play through. However, I would say to any Saw fan or gamer of any type to at least try the game but I feel it isn’t worth paying full price, so my final rating is 3.5 stars out of 5 making the game worthwhile but Konami has a lot of work to do if they want to make the Saw games the next Silent Hill.